A high-precision X-ray technique could catch cancer at an earlier stage and facilitate the development and control of pharmaceutical drugs. A test at DESY’s synchrotron radiation source PETRA III, which used so-called X-ray fluorescence for that purpose, has proved very promising, as is now being reported in the journal Scientific Reports by a research team headed by Florian Grüner from the University of Hamburg. The technique is said to offer the prospect of carrying out such X-ray studies not only with higher precision than existing methods but also with less of a dose impact. However, before the method can be used in a clinical setting, it still has to undergo numerous stages of development. The idea behind the procedure is simple: tiny nanoparticles of gold having a diameter of twelve nanometres (millionths of a millimetre) are functionalised with antibodies using biochemical methods. “A solution containing such nanoparticles is injected into the patient,” explains Grüner, a professor of physics at the Centre for Free-Electron Laser Science (CFEL), a cooperative venture between DESY, the University of Hamburg and the Max Planck Society. 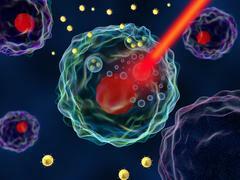 “The particles migrate through the body, where the antibodies can latch onto a tumour that may be present.” When the corresponding parts of the patient’s body are scanned using a pencil X-ray beam, the gold particles emit characteristic X-ray fluorescence signals, which are recorded by a special detector. The hope is that this will permit the detection of tiny tumours that cannot be found using current methods. “In breast cancer, tumours often remain undetected until they are more than a centimetre across,” explains Grüner, who collaborated among others with Christoph Hoeschen from the University of Magdeburg for this study. “Our method has the potential to detect tumours or metastases that are just a millimetre across, which would greatly improve the prognosis.” Another area in which the method could be applied is the development of new medical drugs. In this case, new potential molecules could be attached to the nanoparticles and then traced using X-ray fluorescence imaging to see how the drug spreads through the body and whether it actually reaches the intended site with sufficient concentration. It is hoped that promising candidates could thereby be distinguished from ineffective ones more rapidly than before. Although the ideas of X-ray fluorescence imaging has been around for over 30 years, it has not been possible until now to implement it in human beings. This is because X-rays are repeatedly scattered inside the body. The result is a vast background from which it is very difficult to extract the actual signal. “My team delved into this issue, and we have now become the first group in the world to show experimentally how this problem can be solved,” says Grüner. They accomplished this using a computer algorithm that determines precisely those detector elements within the full solid angle of the measured X-ray spectra whose signals contain particularly little of the background noise. For a first experimental test, the scientists sent the beam from PETRA III through a 30-centimetre thick cylinder made of polymethyl methacrylate (PMMA), which can be used to simulate the conditions in human tissue. These measurements of the background signal provided good confirmation of the preceding simulations. They also showed that X-ray fluorescence imaging promises to require significantly lower levels of radiation exposure than computer tomography (CT): whereas radiation levels are four to seven millisieverts in a CT, Grüner calculates that X-ray fluorescence imaging could get by with around one millisievert. Furthermore, to locate the same number of gold nanoparticles using a normal CT scan the dose would have to be increased to unacceptable levels. However, before the method can be used in medical diagnostics, it will need to be developed a lot further. Among other things, the effect of gold nanoparticles on the human body still calls for closer examination. Another obstacle is the availability of appropriate X-ray sources. Large particle accelerators like DESY’s PETRA III, with a circumference of more than two kilometres, are not suitable for a hospital let alone a doctor’s surgery. Innovative accelerator technologies which are currently being developed could however make it possible in future to build X-ray sources that can provide the necessary quality for such experiments while still fitting inside a laboratory. 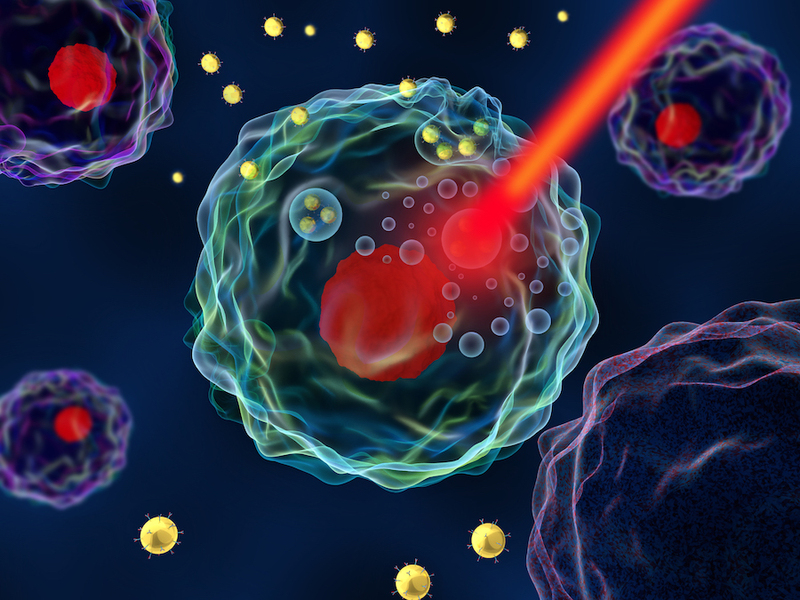 This work marks a first step towards future biomedical applications of X-ray fluorescence, which is not confined to the use of gold nanoparticles. With funding from the Hamburg Innovation sponsorship programme and in cooperation with the company innospec UG, Grüner is planning to carry out high-sensitivity measurements on contrast agents for clinical imaging using DESY’s X-ray source PETRA III. Scientists from the University of Hamburg, the University Medical Centre Hamburg-Eppendorf, the Otto von Guericke University of Magdeburg, the Sloan Kettering Institute in New York City, Cornell University in the US state of New York, the Helmholtz Centre Munich, the University of Arizona in Tucson and from DESY were involved in the study that has now been published.